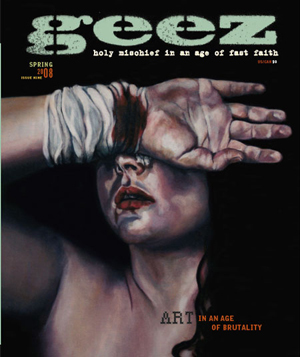 Geez, the Winnipeg based ad-free magazine devotes its spring 2008 issue to the theme Art in an Age of Brutality. The articles are woven around a quote from Thomas Merton in Disputed Questions. The style of the magazine is such that the articles are brief, engaging and thought provoking if not just provocative. The range of issues addressed is impressive and there is much to learn and much to disagree with. It has been said that learning takes place best in “conflict situations” that is in situations where there is a dissonance between what you think and what you are reading or hearing. It is in that place that reflection is engaged and critical thought does its work. Geez provides such a place. Co-editor Aiden Enns writes about the art of compassion. Here he advocates for a public role for art – a role which invites the artist to speak to prevailing concerns in the culture. But he also sees art as having a capacity for consolation and so affirms both the prophetic voice in art and the hopeful presence of creativity. Nicolas Klassen is clear in his claim that art will not save the world. Despite strong and eloquent statements like Picasso’s Guernica – human behaviour seems to show little sign of change. Miriam Meinders the other co-editor, in her Notes toward a moral beauty, reveals a particular take on truth and beauty when she asks “… what then of ugliness?” suggesting that it doesn’t fit with truth and beauty. But surely it does – as art is able to capture the dark and difficult side of human existence and not leave us trapped there enabling us to see beyond – which she suggests is something we all wish to do. Two other articles I will mention one raised some questions about theological concerns the other offered an implicit challenge to the approach the magazine employs in its engagement with social, cultural and religious themes. The first Not Creator, Creativity by Jesse Nathan offers a take on our understanding of God which counters traditional Christian accounts of God. There is a familiar ring here, is it Babel or just 18th century enlightenment’s wish for autonomy and belief in progress? What is lost here is the tradition’s understanding of God as triune – personal and engaging in history not least through incarnation. The underlying argument is the affirmation of mystery – but surely that is not incompatible with the received theological tradition.The second article was by Calvin Seerveld which he titles; Better to reform than to subvert, also with art. In this brief and insightful article Seerveld explores the difference between subversion and reform. He writes “The root biblical mandate does not promote subversion but asks for a converted peoplehood who are prepared to do good for Babylon, where some are exiled (Jeremiah 29:7) and overcome evil by doing good (Romans 12: 9-21) at the cost of one’s lifetime.” Subversion is on the agenda of those at Geez magazine but it is the kind of magazine that opens the door to critical reflection on the issues and Seerveld has served up good grist for the mill on this subject. Geez is not a magazine for everyone. It follows well its byline – “..holy mischief in an age of fast faith”. I picked up a copy at a magazine stand in the Queen Street West area of Toronto – a place where popular culture, its practicionaires and consumers, and all its attendant features loom large. But I think that many will find it a refreshing and instructive journal and I for one am glad it has taken up the subject of art.